On May 8-11, Chinese Premier Li Keqiang paid an official visit to Japan at the invitation of Japanese Prime Minister Shinzo Abe. On May 8-11, Chinese Premier Li Keqiang paid an official visit to Japan at the invitation of Japanese Prime Minister Shinzo Abe. On the occasion of his visit, the Chinese Premier published an article – Let the Cause of Peace and Friendship between China and Japan Set Sail Again – in one of Japan’s most influential newspapers, Asahi Shimbun. The article has resonated tremendously with the Japanese public, especially on issues such as expanding Sino-Japanese economic and trade cooperation. The security situation in East Asia has eased with the warming of relations between the two Korean republics and between the DPRK and the US. This also provides a relatively stable environment for economic cooperation among East Asian countries. There is no better time for the Premier Li Keqiang to visit Japan than now. It is predicted that through this visit, Sino-Japanese economic and trade cooperation will open a fresh chapter in several respects. Firstly, in terms of multilateral economic and trade cooperation, the visit promises broader scope. Li Keqiang first attended the 7th China-Japan-South Korea leader’s meeting. In addition to negotiations on denuclearization and a permanent peace plan for the peninsula, in the context of “reverse globalization” and the apparent rise of trade protectionism, China, Japan and the ROK will reboot economic cooperation among the three countries in order to safeguard the multilateral trading system. After the China-Japan-ROK summit, leaders of the three countries expressed that they will strive to reach an early consensus on the China-Japan-ROK FTA. A new China-Japan-South Korea East Asia free trade system will emerge from the existing China-Japan, China-Korea, and Japan-South Korea relationships, and bring the three countries together to promote multilateral economic and trade cooperation through a new and much larger system. In fact, the China-Japan-Korea Free Trade Area was proposed as early as the China-Japan-South Korea leaders’ meeting in 2002. It was envisaged that the China-Japan-Korea Free Trade Area would consist of a large market with a population of over 1.5 billion. Tariffs and other trade restrictions in the region would be abolished, allowing a smoother flow of products. Through the proposal, local manufacturers would be able to lower production costs and expand markets and revenues, and consumers would have access to lower-priced goods as well. However due to external intervention and interference, the build-up of the China-Japan-Korea Free Trade Zone has made slow progress. At their meeting on May 8, the leaders of the three countries actively expressed their willingness to accelerate the build-up of the free trade area, and set clear goals for the three countries’ economic and trade cooperation with the goal of resisting trade protectionism. In future Sino-Japanese economic and trade cooperation is likely to be carried out within this larger framework, enabling greater stability and durability. The China-Japan-ROK summit also decided to accelerate the process of RCEP， and to set up a mechanism of China-Japan-ROK plus, to cooperate with other economies in Asia and elsewhere. Secondly, the visit offers the opportunity for stronger as well as broader ties. During the visit, Li Keqiang announced that China will agree to grant Japanese investors an RMB-qualified foreign institutional investor quota (RQFII). RQFII refers to RMB-qualified overseas institutional investors. RQFII overseas institutional investors have an authorized quota to invest in the Chinese financial market. This move means that China has partially opened up its market to Japanese financial companies, and will offer them huge business opportunities. In recent years, although trade between China and Japan has maintained steady and strong momentum, there still exist some problems in the economic and trade structure. According to its customs statistics, in 2017 Japan’s imports and exports with China reached 297 billion U.S. dollars – a 9.9% year-on-year rise. China, together with the United States, has become one of Japan’s two major foreign trade pillars. Of Japan’s total exports, 19% go to China, which is almost the same as the United States share (19.3%). Japan’s main exports to China are electromechanical products, which account for 42.3% of the total. China’s major exports to Japan are also electromechanical products, which account for 45.8% of this total. China’s initiative in opening part of the financial market to Japan has laid a solid foundation for the financial cooperation between the two countries. Sino-Japan economic and trade cooperation will be upgraded from manufacturing to financial services and other higher dimensions. Finally, the visit presages a new stage in depth of contacts. 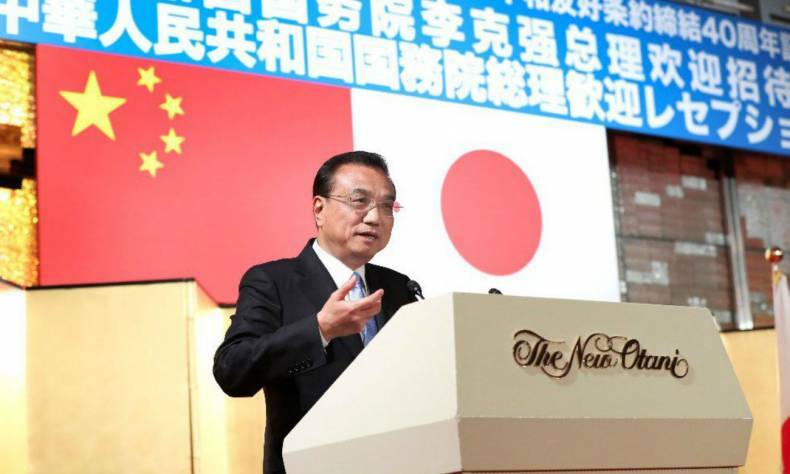 In the Asahi Shimbun article, Premier Li stated that in the new wave of science and technology and industrial revolution, China and Japan have great prospects and potential for cooperation in a number of areas, including energy conservation and environmental protection, technological innovation, high-end manufacturing, finance, shared economy, and medical care of the elderly. During the visit, China and Japan will sign a series of cooperation agreements in health and medical sciences, service industries, and social security, and negotiate a local currency swap agreement. In addition to visiting Tokyo, Premier Li also visited Hokkaido. Hokkaido is Japan’s granary, and is a leader in modern agriculture in Japan. The visit to Hokkaido demonstrates that China intends to learn from modern Japanese agriculture in order to vigorously transform the mode of agricultural development, accelerate the construction of modern agriculture, and comprehensively improve food quality and safety. In addition, “One Belt and One Road” is also one of the key topics of Premier Li Keqiang’s meeting with Prime Minister Abe. In recent years China’s “One Belt and One Road” strategy has achieved remarkable results, attracting a growing number of participating countries, with the result that market potential has grown correspondingly. Japan is well aware of this opportunity. The 2017 Sino-Japanese relations public opinion survey report shows that over 60% of Chinese respondents hold a positive attitude towards globalization, and 62.7% of Chinese respondents hope that Japan will join the “Belt and Road “initiative and the Asian Investment Bank. Japanese political and economic circles have already stated on various occasions that they are willing to participate actively in the construction of the “Belt and Road Initiative” and the Asian Investment Bank, sharing development dividends with China. Premier Li Keqiang’s visit will enable a deeper consensus with Japan’s leadership, and contribute to realizing the visions held by the broader Japanese public. In conclusion, Prime Minister Li Keqiang’s visit to Japan is a first step in strengthening and upgrading Sino-Japanese economic and trade relations under the new situation, which will open tremendous new possibilities for both countries. Will pandas from China help improve its relationship with Japan?